Has anyone actually been successful getting Facebook to enforce its own Terms of Service? Because I’m striking out left and right. Oddly, the people having success seem to be the ones abusing the reporting process. In his book Out Of Control: The New Biology Of Machines, Social Systems, And The Economic World, Kevin Kelly wrote about how a network of “dumb” nodes with a set of very simple rules can give rise to complex behaviors that appear to be centrally coordinated. Facebook is like that. Each user is given a very simple set of rules for reporting hate speech and harassment. After applying all the rules across however many tens or hundreds of thousands of people making complaints, a new complex behavior emerges, and it is that of a virtual cyberbully. In what universe does this page, by their own admission, NOT violate Facebook’s policies? Facebook’s universe, apparently. When I reported the page, I received a polite notification telling me that they declined to act on it. Now, I’m the first person to say the issues of which the page is concerned deserve discussion. Our system of law and policy grew up in the assumption of two genders. Setting aside for the moment the psychology of gender, the biology is not binary. There are myriad categories of intersex biology. What we do not know about biological gender outweighs what we do know by orders of magnitude and yet our justice and legislative systems act as if there are only two genders. The system simply assumes that the people who do not fit this binary gender definition are so few that they are statistically insignificant. Any person who accepts those laws as just must then also accept complicity in whatever harm befalls those who fall outside that narrow definition of gender. But the Gender Identity Watch page isn’t interested in discussion and change. A short review of their posts and popular comments reveals a group for whom the biology of gender is firmly binary, despite all evidence to the contrary. I might cut them some slack for simple ignorance if they concentrated on psychology where the areas are much more grey indeed. But no, the page reeks of the smug glee with which they attack people who claim biology doesn’t determine gender. 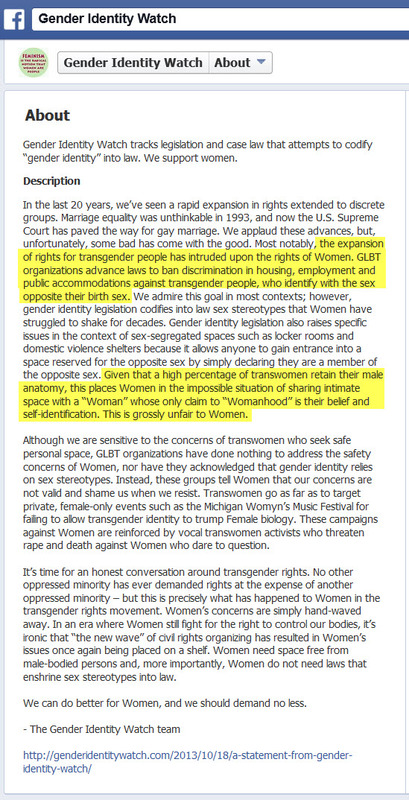 A trans friend familiar with the page tells me that Gender Identity Watch has intentionally outed many trans people and caused significant harm in their lives. I have not been following this group and do not know the history in detail but I trust the source. However, I’d seen more than enough before learning of these actions to know that the page qualifies as a hate group. The group’s policy as stated openly on their page and their overt actions are the textbook definition of Facebook’s policy regarding the targeting of groups and individuals based on gender or orientation. They are a practicing hate group and they are using Facebook to achieve these ends. I realize that there are some who may disagree with my characterization of Gender Identity Watch as a hate group so I won’t rest my case quite yet. Let’s take a look at another page which Facebook refused to remove. This one is called FB Time-Outs for Provaxers. This was a page run by anti-vaccination activists for the sole purpose of silencing pro-vaccination activists. They realized at one point that their takedown requests would be honored if the post to which they objected mentioned a specific individual or account by name. So they taught their community how to troll Pro-Vax sites and users in such a way as to provoke personal responses. Once the pro-vax user made the mistake of responding to them by name or citing a specific medical case, they would then report that person for harassment. Such “violations” could be saved up and then when multiple people reported the same user for multiple posts, it was possible to have that user’s entire account revoked. All ideology aside, here was a page created specifically, once again by their own proud admission, for the purpose of gaming Facebook’s Terms of Service for political ends. When I reported the page, I received the same polite notice from Facebook informing me that, after careful review, a decision had been made to take no action. In what universe does any page devoted to gaming Facebook’s TOS for the purposes of harassing political opponents NOT violate Facebook’s policies? Facebook’s universe, apparently. By now I’m sure you are wondering what this has to do with a cyberbully-bot. Facebook has created a network of “dumb” nodes, with a simple set of rules, out of which complex behavior emerges, seemingly controlled centrally. Though you, dear reader, are not personally dumb, the modes of interaction provided to you by Facebook are sufficiently limited as to make us users collectively fit that definition for purposes of emergent phenomena. Some of the other rules include “bias enforcement in favor of companies” (to preserve sources of income) and “bias enforcement toward compliance issues such as copyright” (because enforcement is more about avoiding liability than about avoiding harm to users). Given this simple set of rules, seemingly purposeful behavior that is complex and independent of any single person’s action emerges from Facebook’s collected activity and users. People who are intrinsically “good” tend not to take advantage of the biases in the system to intentionally harm others. Because of this bias toward evil, the complex behavior that emerges tends naturally toward the infliction of harm on humans. In the end, Facebook itself emerges as a Cyber-Godzilla, wading through the virtual city, trampling people underfoot and leaving a trail of devastation in its wake. In this system, Facebook becomes a tool for outing closeted Trans women, placing them in economic, emotional and physical jeopardy. With these rules in place, Facebook becomes a tool for silencing pro-vaccination activists contrary to public policy, all credible research and common sense. Because of the behavior that emerges, Facebook ends up directly contributing to the epidemic of preventable disease and the associated death toll. And these are but two examples and they exist despite the efforts of many users to prevent the very harm that is being caused. Movies like Terminator scare us with their dystopian future where alien intelligences come alive and declare us the enemy. I’m more worried by a dystopian present in which we fail to recognize that an emergent alien intelligence has declared war against us. To paraphrase Walt Kelley, I have seen the enemy and it is Facebook. The question is whether Facebook sees the enemy and what it will do about that if it does. This entry was posted in Clue train, Global issues, Rant, Social issues, Tech and tagged facebook, fail, future, internet, life, power, rant, relationships, singularity, technology. Bookmark the permalink.